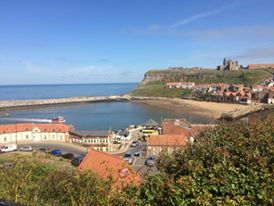 I visited Whitby quite a lot when I was a child, a scenic and atmospheric place everyone should visit at least once! Anyway during one visit I came across a book called ‘Cirque Du Freak’ in a small back-alley book shop crammed full of books in rickety bookshelves. I was thirteen at the time and was intrigued just by reading the first two lines of the book. When I returned home later that evening I became engrossed in the author, Darren Shan’s imaginary world of vampires. I remember buying all the first edition books of the Cirque Du Freak, which I still have to this day, the next book I bought was ‘The Demonata’ and I remember the Waterstones in Middlesbrough had a poster on their window advertising a book signing for ‘Hells Hero’, the last book of the saga I had been reading. I remember being so exited attending the book signing, getting to meet one of my favourite authors and waiting in line along with other excited fans. Over the next couple of years I read all of Darren’s books and after completing my studies at college I moved to Glasgow. That’s when ‘Zom-B’ came out and I became completely hooked on this saga too. 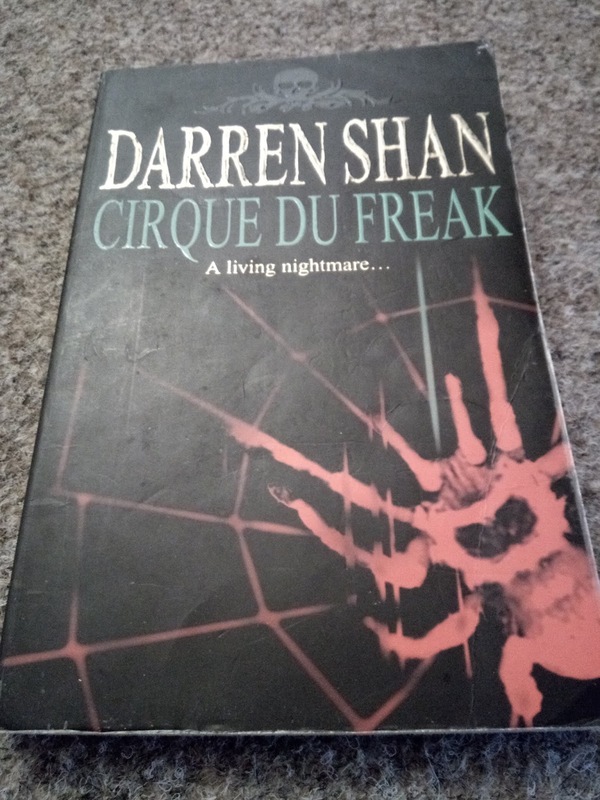 It was also around this time that Darren Shan’s work influenced me to write my own book, of course, the genre would be horror. I plan on revealing more of my own book in the near future, it still needs a lot of work and I want it be 100% before I release snippets or decide to go down the publishing route. I did read some my work at the Edinburgh Horror Festival in 2017. I was so nervous been up on stage I was physically shaking and remember wanting to cry! It was a five minute slot but when I was coming off of the stage I was saying to myself ‘What was I nervous about?’ Everyone clapped and people came up to me wanting to know more about my work. This really boosted my confidence and I would suggest anyone thinking of writing to try this. It is a good way to ‘test’ your work. 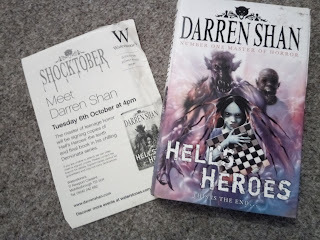 I decided then to contact Darren Shan who was kind enough to grant me a small interview and answer a few questions. I wanted to ask if he had and advice for any novice writers looking to get into writing seriously or seeking advice on publishing. For anyone looking into publishing their finished manuscript, what advice would you give them? The traditional way is probably still the best way, and should probably be the first attempt made, i.e. get a copy of The Writers And Artists Yearbook(or a similar publication), read their advice, go through their list of agents, draw up a shortlist of those you think might be interested in your work, send a sample (50 pages) and a covering letter to a handful of them, sit back and wait -- if one or more of them bites and asks to see more, great, if not, repeat with another handful and, if necessary, repeat and repeat and repeat. If you continue to meet with rejection, self-publishing is certainly an option -- the internet has made that far cheaper and easier than it once was -- but although you can guarantee publication of your work this way, it's a very difficult way to reach an audience. Marketing and publicity are skills that most writers lack, and it also usually costs a lot of money to do them right. Without the support of booksellers and librarians, it’s extra hard to get noticed. There are breakthroughs, but generally speaking, if you self-publish, you should do so on the understanding that it can be very rewarding on a creative level, but is highly unlikely to make you any money, unless you’re capable and prepared to put in a lot of work on the publishing side. 2) For someone who has took a break from writing and is looking to getting back into it, what advice would you give them? Write. It’s my simplest piece of advice to writers, and the piece I repeat the most often, and it’s also the most crucial. When you’re starting out, you should forget about publishing, about marketing, about ways to bring your work to market. Just focus on the writing and do as much of it as you can. The more you write, the more you learn, the better you get. Without lots of hard work on the writing front, nothing else matters. Have fun with it. Push yourself. Try different things. Make loads of mistakes. Learn from them. Improve. And keep going. 3) Do you plan on touring anytime soon? Not until I release a new Darren Shan book, and even then I might not tour as aggressively as I once did. My life has changed a lot over the last few years, since I finished my Zom-B series. I have a four year old son, and a daughter due at the end of March. He drives me mad (and she probably will too), but I love spending time with him and supporting my wife in rearing him, and I’m reluctant at the moment to spend too much time on the road. That might change again several years down the line when the kids are older and not that interested in their old man, but right now I’m not in a touring frame of mind, and since I’m lucky enough to have got to a financial point where I don’t have to do anything I don’t want to do, I’m taking some time off, after sixteen or so years of constant touring. I do miss that close contact with my fans – I always love meeting my readers – but not as much as I’d miss Shan Jnr and Mrs Shan if I was spending weeks at a time away from them. 4) I have recently read at the Edinburgh Horror festival. I struggle with confidence and presenting myself when it comes to reading my work, how do you cope in them situations? I was nervous about this when I first started touring, as I’m a very shy person, insecure in most social situations, especially back then. (I’m better these days, though I still don’t have a wide circle of close friends, and it usually takes me quite a long time to truly feel at ease around someone new.) But to me delight and relief I quickly discovered that, when it comes to performing (as I always think of it when I do an event), I’m an audacious ham! When I step out in front of an audience, a switch flicks inside me and I become “Darren Shan” the author. Having fun with the material makes it a lot easier – I tend not to do overly serious readings – I read out grisly and fun extracts from my books, I’m never afraid to poke fun at myself, I laugh if I make a mistake, and I try to engage warmly with my audience. In my mind I turn it into a show, and I try to entertain, and that works for me. 5) What has to be your favourite quote used in any of your books? “Even in death may you be triumphant.” It’s the line that gets quoted back to me the most (by a long way), and loads of fans have had it tattooed on their bodies. I thought nothing of it when I first came up with it, which was good, as I might have over-thought it and messed it up by trying to come up with something more elaborate, but it’s the one line of mine that I think might long outlive me and take on a life of its own. It will also be perfect for my tombstone, which saves me having to think about that further down the line! 6) I have being reading your work since I was a child (nearly 27 years old) how does it feel to have fans who have grew up with your work? Weird! In my head, I still feel in many ways like a novice. I started out very young as a writer – I was your age (27) when I published Cirque Du Freak, my first book (Procession of the Dead, one of my books for adult readers) had come out the year before when I was only 26, and I had been writing full-time since the age of 23. So even though it’s now twenty years later, I’m still fairly young for a writer, and I don’t always feel like a seasoned veteran, even though I know that’s what I now am. It’s lovely to speak with adults who grew up on my books (I always not-so-subtly remind them that I write for adults too, and release those under the name of Darren Dash these days), and with children who are reading books that have been passed on by their parents who read them when they were children (I haven’t met so many of those second-generation fans yet, but I’m sure I’ll bump into lots of them the next time I tour), but yeah, to me, it’s... weird. I figure I’ll need another twenty years before I really begin to feel that I’ve arrived. 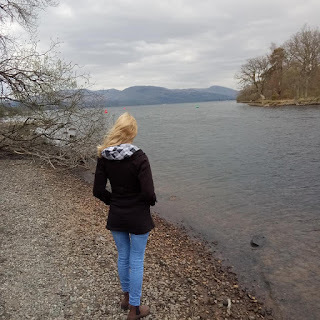 This is where I end it for my second blog and hope this has helped people to be inspired or given guidance for anyone who wishes to start writing, particularly the advice from Darren Shan. Great blog. 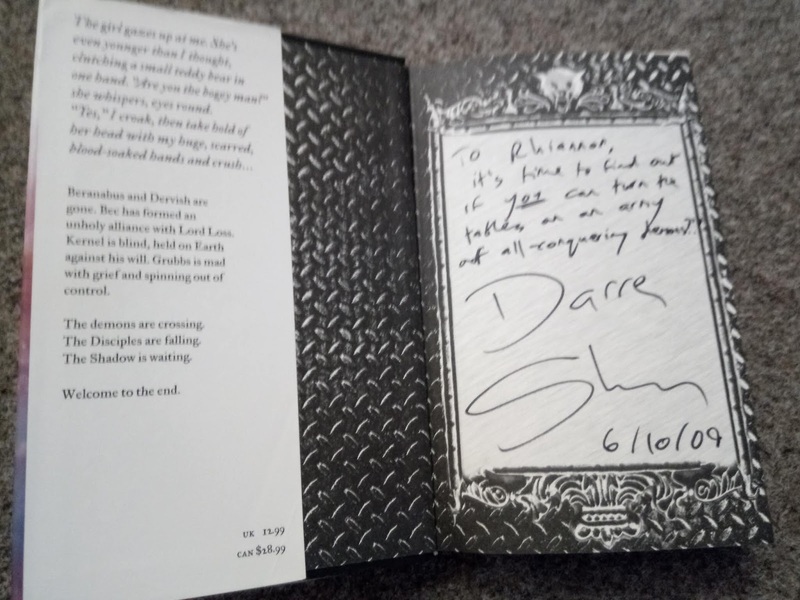 I was 20 when I first got hold of Darren Shan The Tunnels of Blood. I never knew I had it in me to ever read a single book. 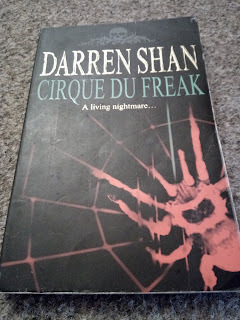 Darren Shan changed that, and now I have read all.his book.